I visited Joey's Smokin BBQ in the Tustin Market Place last night for the first time. I've been meaning to try this place for a while, but the prices have kept me from doing so. I'm not saying that this place is overly expensive. In fact, for BBQ food it's just about the same as most BBQ restaurants. However, when I think about getting "fast food" from a counter service type place, I don't really like the idea of spending over $20 on a meal. Since I love BBQ food and a rainy night seemed as good of a time as any to try this place out, I decided to stop in and get some takeout. While there are many different BBQ foods that I like, I always judge a BBQ place by their ribs. If they can't make good ribs, chances are their other food isn't good either. I decided to go for their full rack of "wet ribs" dinner. ($21.99). The meal comes with two sides and cornbread. I opted for the macaroni salad and the potato salad. the person I was eating with ordered the Pulled Pork Plate ($10.99). This included one side and cornbread. She got collard greens. I ordered the food to go so I could take it home and eat it. The BBQ sauce was in self serve pumps and was held at 150 degrees. I got two little cups of both their "wet sauce" and their "suh-weet sauce". Drinks here are self serve, but I didn't get any. I got home, opened up my box and saw two half racks of ribs. For "wet ribs" they looked kinda dry. I also got two small cups filled with potato salad and mac salad and a little box with a cornbread muffin inside. 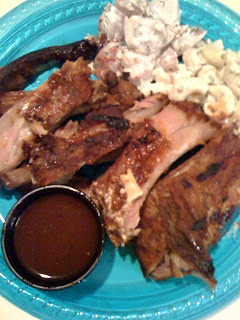 I cut up one of the half racks and put it on a plate with some mac salad and potato salad. I decided I wanted to try the "wet sauce" first. The ribs by themselves were a little dry. They were fall off the bone tender. They had a good flavor but it wasn't too bold. I dipped the rib in some "wet sauce" and was surprised at how tangy it was. It seems as if this sauce is mostly vinegar. Since I really love vinegar, the sauce tasted delicious to me at first. After a few ribs though I started getting sick of it. It was just too tangy to keep eating. I opened up their "suh-weet sauce". I didn't really want to try it because I hate really sweet BBQ sauce. I like my BBQ sauce to be spicy. The suh-weet sauce was actually pretty good though. It was thicker than their wet sauce with more of a traditional BBQ sauce flavor. It was sweet, but not overly so. It wasn't spicy at all. I added some Tabasco sauce and this seemed to be the best combination for me. The potato salad was average and was little on the bland side. The macaroni salad was pretty good. It's nothing compared to L&L but I'd probably order it again. The person I was eating with enjoyed her pulled pork plate. She said it was very flavorful. It didn't have too much sauce, which she enjoyed and it had a slightly smoky flavor. She also liked the collard greens and said they were "dryer" than Lucille's. Overall I thought the food was pretty good. If I was in a rush and really wanted BBQ food I might stop here again. Since it seems to cost just as much though, I'd much rather go to Lucille's.